The No. 1 University of Wisconsin women’s hockey team swept the No. 9 University of North Dakota Fighting Hawks in Grand Forks, a first since 2010. The Badgers (7-0-1, 5-0-1 WCHA) started off the weekend against their WCHA rival with an intensely matched game Saturday, with both teams scoreless after the second period. Junior Emily Clark would be the first to score in the game, netting her first goal of the weekend almost seven minutes into the third period. Clark, who has become a major scoring force for the Badgers during the past few weeks, would find herself joined by another teammate. Senior Sarah Nurse would tally an impressive five goals for Wisconsin this weekend, earning her first hat trick of the season during Sunday’s game. 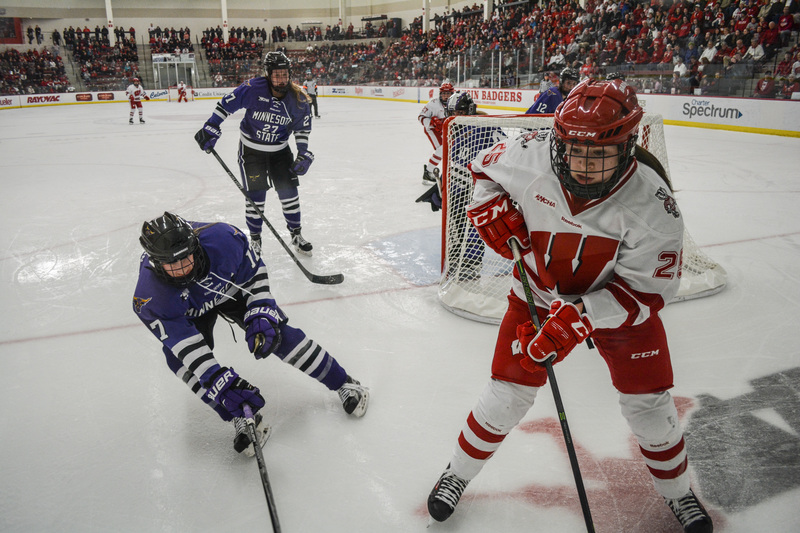 Nurse helped to solidify Saturday’s win with an empty-net goal with nine seconds left in the third period, and the Badgers would pull away from the Fighting Hawks (4-3-1, 3-3 WHCA) 2-0 Saturday afternoon. She followed this up with an impressive four goals Sunday, and UW went on to clinch the weekend with a 5-2 victory. Saturday’s victory shutout also brought senior goaltender Ann-Renée Desbiens one shutout closer to tying the NCAA career record. 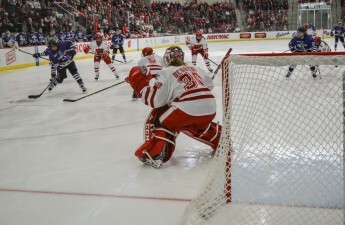 UW’s star goaltender is now two shutout games away from clinching another milestone to add to her list of accomplishments during her time at Wisconsin. Desbiens had a major challenge for her this weekend, with North Dakota sending many wild and powerful pucks her way. Combined with the six power plays Wisconsin gave the Hawks, Wisconsin head coach Mark Johnson told UW Athletics that he was proud of the effort he saw come from his netminder. Desbiens, who is one of the numerous reasons the Badgers have been able to hold on to their No. 1 national ranking for the first five weeks of the season, knows the best she can do for her team during intense moments is keep calm and stay focused. With this weekend’s sweep, she has certainly proved she is more than capable at defending her net against even the toughest opponents. Desbiens and the Badgers now travel to Mankato, Minnesota this week to take on Minnesota State University for a WCHA showdown.